Aviators Individual Game Tickets on Sale Now! Individual Game Tickets for the 2019 Season Go On Sale on Tuesday, March 5 at noon through ticketmaster.com or by phone at 1-800-745-3000! 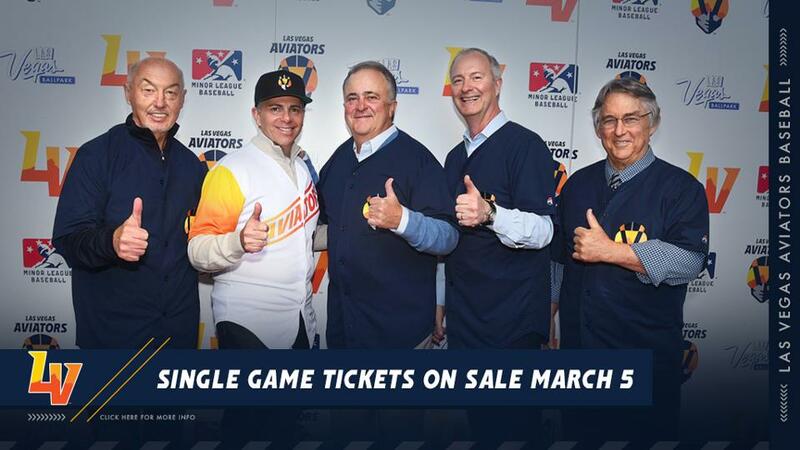 LAS VEGAS: The Las Vegas Aviators® professional baseball team of the Pacific Coast League (PCL), Triple-A affiliate of the Oakland Athletics, announced today that individual game tickets for the 2019 season, the inaugural campaign in the Las Vegas Ballpark® and the 37th season in the Silver State, will go on sale on Tuesday, March 5 at noon. Tickets will only be available to purchase through Ticketmaster (1-800-745-3000, www.ticketmaster.com). Americans with Disabilities Act (ADA) and ADA accessible seats will also be available to purchase through ticketmaster.com. The Aviators will be offering a military and first responders discount through the team's partnership with GovX (www.govx.com). The discount (TBD) will be available at the Las Vegas Ballpark box office, once the ballpark construction is completed. The 2019 Aviators promotions schedule will be announced soon. The traditional "Fireworks Extravaganza" will be presented on Wednesday, July 3 vs. intrastate rival, the Reno Aces. The Aviators, under manager Fran Riordan, will open the season with a five-game road trip in El, Paso, Texas against the Chihuahuas, Triple-A affiliate of the San Diego Padres, from Thursday-Monday, April 4-8. The Aviators will then return to Las Vegas for the home opener on Tuesday, April 9 against Sacramento.